Q: How would you describe the event and what were the key objectives? In mid-July 2016, Bled represented a grand backdrop for the biggest wedding celebration ever hosted. Farah, a bride from Kuwait, chose Lake Bled as her dream wedding destination in her early age when she visited this alpine gem with her grandmother. Farah and Talal, newlyweds, hosted more than 400 guests in a celebration at the Grand Hotel Toplice that lasted 3 days. This historically elegant hotel from 19th century was totally rearranged with white sofas, idyllic floral decorations and delicate lightening. All the details of the ambience, service and offerings on the spot were carefully considered and more than 100 people ensured that the event ran smoothly. Preparations lasted almost 1 year with the bride’s sister in charge to communicate the whole organization with the Slovenian wedding planner agency DaPetra. Their aim was to balance typical Arab tradition with modern trends. The celebration was opened by the bride and her father coming directly to the Grand Hotel Toplice Hall by “pletna” boat. The groom, in contrast, entered the venue loudly with a group of his friends. Starting with a wedding cake due to their customs and continuing with a rich buffet and the best accompanying wines, a party lasted until the early morning hours. Most of the food was prepared in front of the guests, while the whole menu was tested twice before D-day came. 400 guests were accommodated in 3 hotels, leaving them totally overwhelmed about the natural beauties, the cleanliness of the place. The key challenges of this event were connected with its size, dimension and cultural differences. Accommodating 400 highly demanding guests from Kuwait within 3 Sava group hotels besides hosting a grand wedding celebration was certainly a difficult yet very pleasurable mission. Preparations lasted almost a year, having the most experienced internal and external team members on board. To be able to fully understand Arab tradition and culture a Slovenian wedding planner conducted several meetings with the whole working team involved. A lot of flexibility and professionalism was shown from the side of our culinary chefs and maîtres. Contrary to ours typical wedding party protocols, Arabs are serving cake at first and then other warm dishes follow. Besides there was not an average buffet display but several food stations so that every dish was prepared and presented in front of the guests, from traditional to modern ones. For the bride and her friends a team of 20 hairdressers and makeup artists was appointed, additionally there were our housekeeping ladies, porters and hostesses taking care that nothing was left to coincidence. In regards to the event organization, to be creative means to incorporate and produce non-conventional elements to the existing environment considering event profile specifics. For the dream Kuwait wedding celebration a venue- Grand Hotel Toplice was totally rearranged. As the Grand Hall alone was too small in size to cater a banquet for 400 guests, we emptied a hotel restaurant located next to the hall and completely opened up the space. Before the event a Grand Hall was carpeted in blue but to match the whole new glam design, we changed the carpet to soft champagne coloured one. Hiša vizij, event design company, rented out an equipment- for sound system, light system and scenography that transformed a historical hotel venue into a real fairytale. A team of florists created complex yet delicate decorations for the tables and also hanged some on the ceiling to cover the existing construction. Our chefs proved that culinary is an art itself – taking in consideration typical Arab cuisine they blended it with traditional local one prepared in a modern way. A mobile bar station was placed in the hall with various drink offering –from local wines to the most exclusive world-class liquors. For the surprise element of the bride entering a venue we came up with the idea of her father accompanying her on the ride with a traditional “pletna boat”. When the sunset started they stepped out from the boat directly on the newly built stairs in front of Grand Hall. 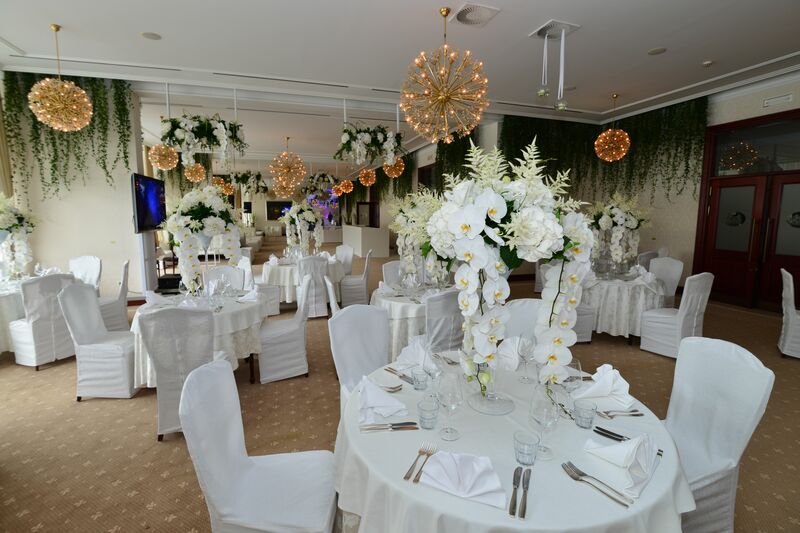 Accommodating 400 Arab guests for 3 nights within Sava Hotels Bled and hosting a wedding celebration party in Grand Hotel Toplice was in all means one of our milestones for the year of 2016. It was the largest banquet event we have ever hosted and besides the financial outcome there were numerous multiplicative effects. Slovenian and foreign media wrote about this event in a very positive connotation and social media channels were full of live impressions from the guests’ side being totally overwhelmed about the beauties of the destination. It was a great promotional event for Slovenia and Bled as a lot of guests showed an interest to return and they are definitely spreading a word within their circles. Internally we upgraded a lot of our offerings and learned how to fulfil the needs of the most demanding Arab guests which we would definitely use in practice also in advance. Slovenian and foreign media wrote about this event in a very positive connotation and social media channels were full of live impressions from the guests’ side being totally overwhelmed about the beauties of the destination. It was a great promotional event for Slovenia and Bled as a lot of guests showed an interest to return and they are definitely spreading a word within their circles.